NJDC Cares, located in Somerset, New Jersey strives to help restore and develop the lives of individuals, youth, and families by providing housing, hosting various programs, and through our philanthropic endeavors. Our mission is to use our passion for real estate to motivate, inspire, and create a positive change in the lives of families and individuals we encounter. We desire to afford others the opportunity to live in comfortable, modern, but yet affordable housing. 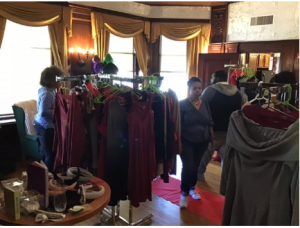 Our New Jersey-based organization was able to set up the Francesca’s donations of women’s clothing, shoes, handbags, and jewelry to hold a free Pop-Up Clothing Boutique for women living in shelters and transitional housing. It was our pleasure to pamper, serve and see the women enjoy their free shopping experience, as if they were shopping at an actual retail store. To connect with the women and see their confidence and level of hope soar was priceless and a job well done. There is a great need for new casual and business clothing for women dwelling in shelters and transition housing. Our organization aims to be a solution, so we jumped on the opportunity to partner with Francesca’s to help close the gap on needed new clothing and lack of resources. Tatyana was one of our recipients and was greatly affected by this donation. She’s a young adult, expecting her 1st child and dwelling in transitional housing for women and children. Once we found out it was her birthday and she was expecting a child, we immediately responded to see what her needs were. She was able to find a special birthday outfit, get her hair styled, and leave with multiple clothes and shoes in her size! It was priceless and amazing to see how through our partnerships, we were able to help meet her needs that day! After her experience, she also expressed that she needed a job, so we connected her with a job resource center in the neighborhood and they immediately got her started with revising her resume and applying for a job! We really appreciate the partnership with Good360 & Francesca’s and look forward to partnering again to help service the needs of the community!